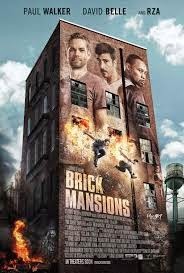 Full disclosure, I have not seen the original Luc Besson action film District B13 upon which this Americanized remake Brick Mansions is based. I mention this only to qualify that if I had seen the original, my opinion of the remake would no doubt be somewhat more muted if not completely different, much as my opinion of 2012's Dredd would have almost certainly been less effusive if I had seen its far superior stylistic inspiration The Raid beforehand. In retrospect, I'm glad I saw Dredd first so that I can remember both films as enjoyable, and the same goes for this movie, or probably will assuming I ever see the film its based on. Then again, all action movies now pale in comparison to The Raid 2 anyway, so its already working at a deficit. I'll try to be fair nonetheless. Brick Mansions is the story of an overly committed undercover cop and an acrobatic vigilante resident of the titular Detroit housing project, a walled off ghetto under Marshal Law following some near future criminal shenanigans. Mostly notable as one of the last films to posthumously feature the late (great?) Paul Walker, this is a lighthearted action flick that would have felt right at home in the 80's back when dystopian crime ridden cities filled with nothing but black people wasn't racist for some reason, and all we needed to distract us from the lack of substance was a few quips and a lot of punching and roundhouse kicks to the face. Because this isn't the 80's, we get that, plus parkour, which I gather I'm supposed to be sick of by now thanks to being inundated by Youtube clips of similar stunts, but since that meme thankfully passed me by when it was relevant, I found myself suitably entertained by it. There's a moment in the film when the two main characters, having just recently put aside their contrived differences in order to work together against an equally contrived mutual threat, are running away from the bad guys, only for the one that knows parkour to leap off of a wall and impossibly into a small crevasse above a doorway. The guy who doesn't know parkour (i.e. the American guy) is left dumbfounded, while his partner waits on the other side expectantly, as if it only just suddenly occurred to him that not everyone has his insane agility. Most of the movie works out like this, with the French acrobat (apparently a carryover from the original film) performing amazing feats of skill with a Batman-like ability to use his environment to his advantage, and then Paul Walker sort of blunders in behind him. One would think it would have been more successful with two guys who were equally athletic, but then we wouldn't have our dumb guy entry point into this story, as if we needed one. I honestly don't want to sound like I'm making fun of the film for being dumb, which isn't to say that it isn't really dumb, except that this is the kind of movie that you sort of want to be dumb, if that long and rambling sentence makes any sense. You know the kind of movie where its sort of racist until you realize that the rich white guys are the real bad guys, so its okay? That's this movie, but instead of that being the twist, its literally in the first scene, with the mayor and a bunch of private investors practically toasting to evil as they plan a new bright burrow for white people once the Brick Mansions are gone. Their plan involves a mercenary turned drug smuggler turned gourmet chef played by the RZA stealing a neutron bomb, accidentally activating it, and then waiting impotently for the timer to go down and blow up his city, instead of doing what he actually does, which is strap the thing to a Wile E. Coyote-style cartoon rocket with the film's damsel in distress attached to it by a chain dog leash. Why even put a timer on it in the first place, when you could have just had it go off a second after he opened the thing? That's the kind of movie we're dealing with, and call me crazy, but it mostly works. Yes, its ridiculous, but it doesn't apologize for it and just openly embraces its ridiculousness in that special way Luc Besson does when he's at his best (or at least not completely in it for the paycheck). This isn't him phoning it in like 3 Days To Kill, or if it is, it doesn't feel like it, even if it obviously lacks the passion of Leon or the creative insanity of something like The Fifth Element. Everybody seems to be having fun jumping on roof tops and flipping around everywhere, and at least for me, the fun was infectious. Aside from the ick factor of one scene where he literally crashes a car headfirst into a wall at 80 miles an hour, its a fitting end to Walker's career at least considering his penchant for popcorn flicks like the Fast and Furious movies, since he's practically winking at the camera in every scene inviting the audience to smirk along with him. It would be easy to pick it apart from a thousand different angles, and its probably the definition of a Shut Your Brain Off Movie, which even for me is rarely appealing, but sometimes even I need a break. If you do too, give Brick Mansions a shot, you might be surprised.